One of the things I like most about being part of the hocoblogs community is the encouragement (and the inspiration) to try new things. Like canning. Between HowChowBlog, LisaBMrsS, and The Soffrito, I am working my way up and now have conquered tomato sauce. Before processing in the hot water bath, two quarts of sauce. This took about 20 of the heavy beefy tomatoes from our Larriland visit. I roasted them, after halving them and scooping out the seeds. Pulled off the skins once they cooled a bit. Put them in a pot with gently “sweated” onions, shallots, garlic and olive oil. Added some Italian seasoning, salt and pepper. Cooked for about 30 minutes. Ladled into the jars, with lemon juice and a pinch of salt. Processed for 45 minutes. Until I was encouraged by my fellow bloggers, to take that step from freezing to canning, I wouldn’t have done this. HowChow got us interested in picking at Larriland. Lisa encouraged me once I did my first jars of jelly. Victoria at The Soffrito back in our food challenge days showed me meals made from her canned items. All told, I have made three pints of oven roasted tomatoes, four bags of whole peeled blanched tomatoes and two quarts of tomato sauce. I have enough tomatoes left to make two more quarts of sauce once the last 20 tomatoes get ripe enough. I figure that if I bought organic sauce, canned tomatoes and roasted tomatoes, it would have cost us at least $40. We got these 24 pounds of tomatoes at Larriland for $16. I think that’s worth the price. Don’t you? Didn’t get to pick apples today, but we are heading out there tomorrow. Canned applesauce coming soon to the kitchen near me! Posted in Farms, Food, Local Businesses, Locavore, Real Food and tagged cooking, farms, Food, foodie, local businesses, Locavore, real food, tomatoes. Bookmark the permalink. The sauce looks and sounds delicious! Thank you for turning me on to freezing food! I think you will be happier with the canned sauce than with frozen. Frozen tomatoes just seem to get watery and require some extra cooking when they’re thawed to get rid of it. At least for me. Canned sauce (or tomatoes) don’t seem to get that way. Wait until you open that jar in February – the smell is heaven!!! Now you need to get a food mill! Then you won’t have to remove skins & seeds beforehand. Simply cut the tomatoes into pieces & add to sweated aromatics. When the sauce is done cooking, run thru food mill and that will easily take off the seeds & skin. 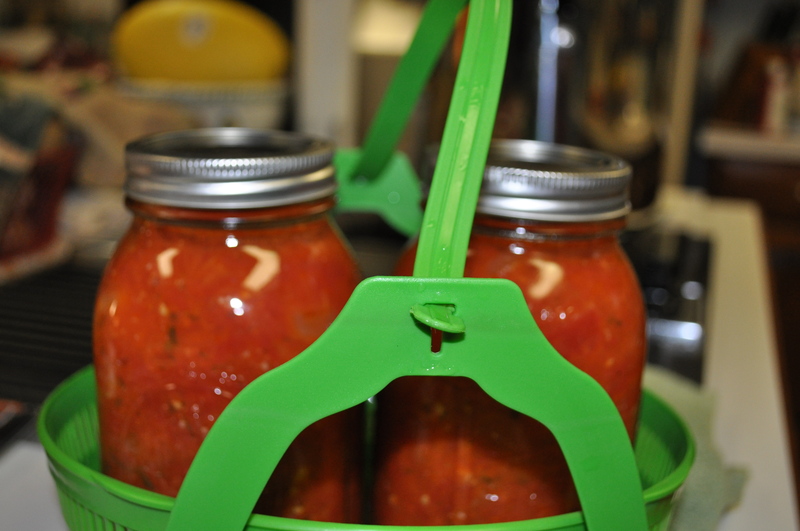 I echo Marcia’s food mill comment–I canned crushed tomatoes last year and borrowed a friend’s late mother’s pressure canner to can meat tomato sauce. Bon, as my French-studying daughter would say. Early September I saw a food mill at the thrift shop where I work, bought it, and it was really made this year’s canningpalooza easier. I maxed out on crushed tomatoes, branched out to seasoned and unseasoned tomato sauce, salsa, green tomatoes, and most recently tomato jam. Food In Jars (eponymous book from the lovely food blog, picked it up at my local library) is a terrific source for interesting small batch recipes. 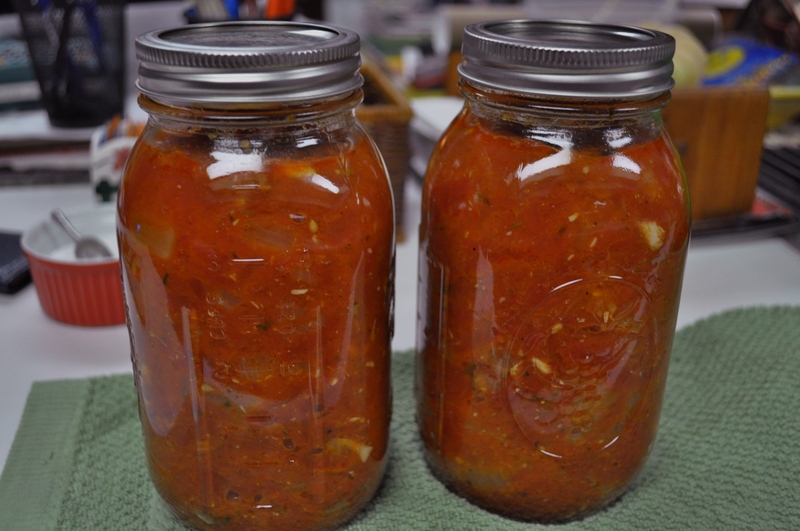 Now that you’ve mastered your fears of canning, I can’t wait to see what you do next season!